The kids at his school have lunch money accounts that parents fund. The parents are supposed to get an email when they need to add money to the account. There is no need to stamp students for this. We have plenty of ways to get a hold of people. This was completely unnecessary as the school even has a policy in place for contacting parents. The kid doesn’t even buy lunch, but brings it from home. He mostly uses the account to buy the occasional ice cream, or other treat. So, how much did the child owe? Nothing. The account was simply running low, and he only had $1.38 left. For that, they branded him with a stamp that has the potential to do a lot of damage. Kids already bully each other. Do we really need to add to the problem? The school said that they usually send an email, or call when the child’s account is low or negative. 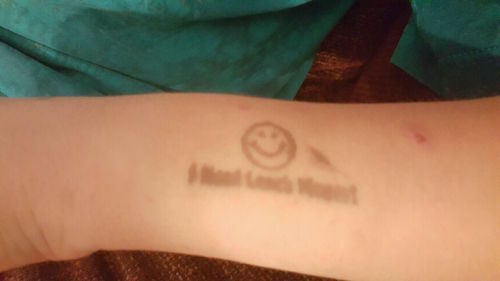 The principal said that they only use the stickers or stamps when the e-mails go unanswered. Mr. Bevins said that he did not receive any calls or e-mails. The kids who don’t have money for lunch are usually given a peanut butter and jelly sandwich and an apple. This is not a unique case. A student in Dickinson, Texas had her lunch thrown away because she was $0.30 short. Instead of feeding a hungry child, they trashed the food that likely cost 10 times more than the $.30 the child owed. The school usually sends alerts when kids’ accounts are short. This time, they wouldn’t allow the child to eat breakfast until the parents sent money to replenish the account. It’s absolutely ridiculous. Kids do not deserve to go hungry over $0.30. That’s insane, really. Featured image by Joe Bevins Via AL.com.